It's interesting to see variations of the shed plans I have sold. It just goes to show you that you can modify my plans and blueprints to accomodate whatever special needs you may have. Jon sent me this picture of his neat barn shed. He used my 12'x12' barn shed plans and modified them somewhat by changing out the 5' double shed doors to a single shed door. 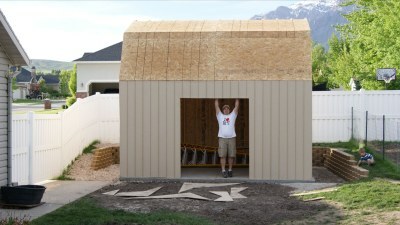 Great job Jon on building this neat shed! I love the color too of the siding and trim together. 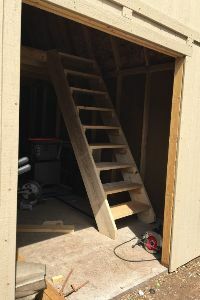 Here's David's picture of his neat 12x8 saltbox shed. David is almost 70! David, I hope I can do this when I am 70, which is not too far away for me! Thank you for your inspiration! 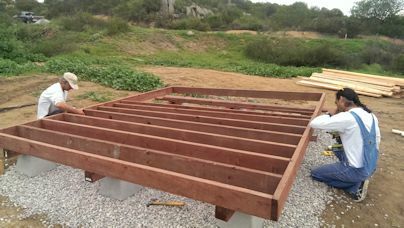 He modified the roof structure by extending the eaves to 8", and used galvanized 2x6 metal studs for the floor framing. Learn more about the plans David used. 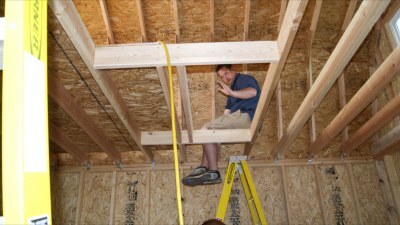 "Hey John, I enjoyed looking at sheds that people built with your plans that are posted on your website. You asked me if you could use my photo on your Facebook page and website. Actually I would love that. 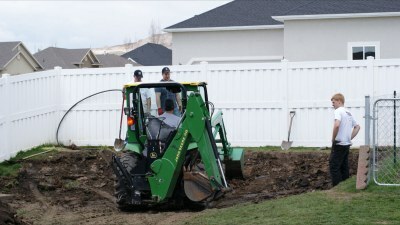 There were a few photos of your customers in various stages of the build. I thought I would send you a few to chose from if you can use them. Two things I wanted from a shed. I have an open carport and no basement. Besides needing lots of space for storage, I really wanted some where I could work on things. I chose the Gambrel style due to the loft storage and the fact that I would have plenty of room for a small workshop. You said my shed was the first photo you got with the doors on the long side. I thought long and hard where I would put the doors." 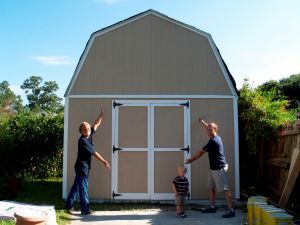 "The number one purpose for my shed being built where I put it in my yard, was our extremely nosy, gossiping, putting her nose in other peoples business, backyard neighbor. They have a glass sliding door that they love to look out. 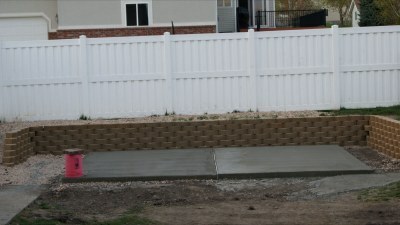 Our small deck was in their line of sight, not no more!! He He. The two neighbors on either side, put up fences to isolate themselves. One older neighbor came by when I was just starting to build the shed and asked me, are you planning on planting some Elephant Ear plants this year? I said probably, why you ask? He said because they blocked the woman behind our house line of sight when they sit out on their deck. I asked him, let me guess, she started some sh...t with you, oh boy did he have some things to say about her. She’s like 80 now but still causing s.... with everyone. When and if you use my photos and story, please send me a link so I can enjoy what you used them for. I can’t seem to find your Facebook page......later"
See more of Steve's pictures of his shed on my facebook page. Learn more about the plans Steve used. 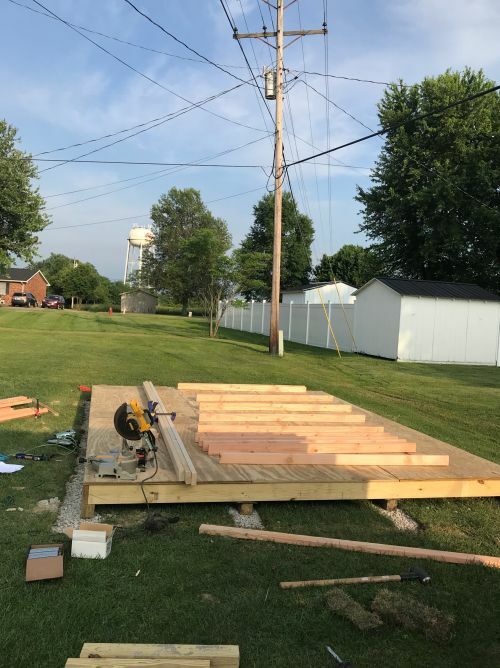 Here's pictures of Matt's 12x16 barn with front porch he built. 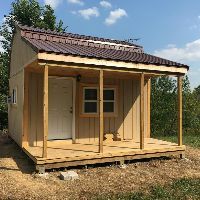 This quaint little tiny house, (shed home or even a small cabin), has a 6'x16' front porch, front entry door, and a total of 4 windows. 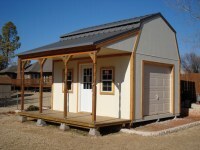 You can learn more about the plans Matt used here: 12x16 barn shed plans with porch. 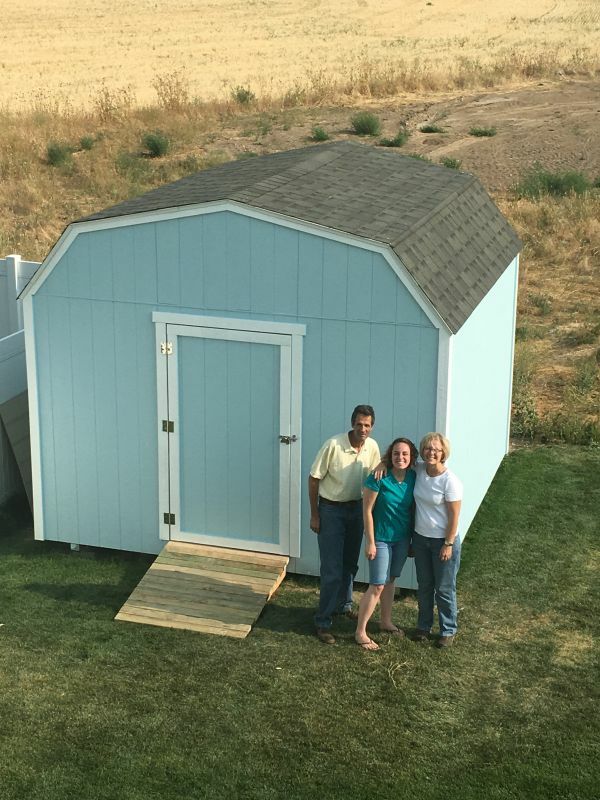 Great job building this neat shed Matt! And thank you for sending me pictures! 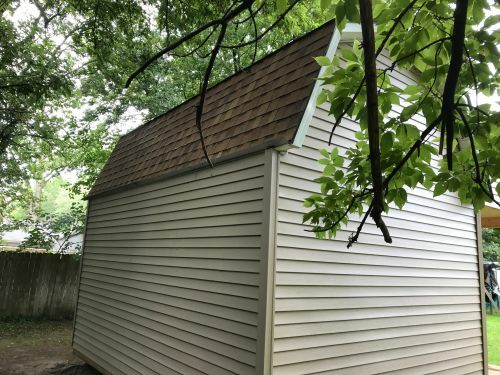 Nice Siding on This Shed! 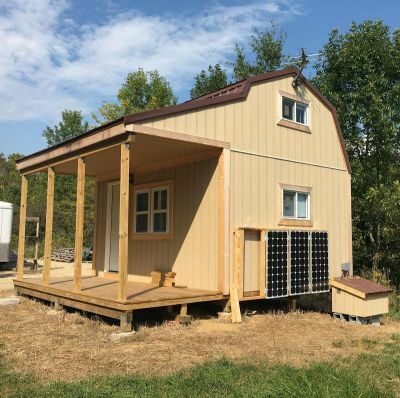 Tim used my 12x16 barn shed plans with porch to build this livable off grid small cabin. 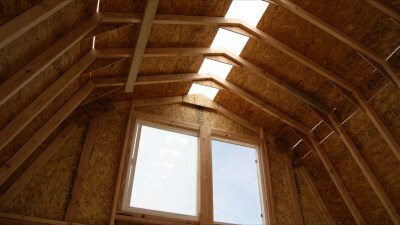 He added solar panels for electricity, and windows in the loft area. Here's a comment Tim added with the pictures he sent: " I modified the plans to have a block between the porch and structure. 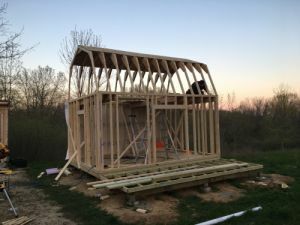 We have also added raised floor during the framing to put insulated sheeting in the floor to have it insulated, but away from bugs and critters. " Here's the plans Tim used to build this neat small cabin. 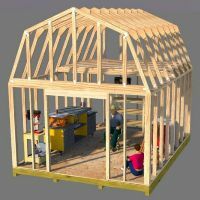 "We had an old fashioned barn raising and my sisters, daughters and I with a little help from my sons and a couple of nephews built my new Woodshop using your plans. Everyone that sees it is shocked that a woman organized and built it." Heather's Wood Shop - Wow! She Even Built a Stairway! 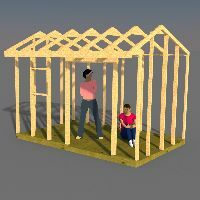 Here's the shed plans Heather used. "Hi John, I finished my shed awhile ago but I am just now getting around to thanking you for your excellent plan. It is clear and very easy to follow. Also the cut list is perfect and saves hours of figuring. I worked as a carpenter for forty years and didn't think I'd enjoy working again until now. I included a few pictures and thanks again. Have a great holiday!" Jerry built this 8x10 barn shed and did such an amazing job modifying the doors by adding windows to them. He also modified the area just above the shed doors by adding in a transom window. 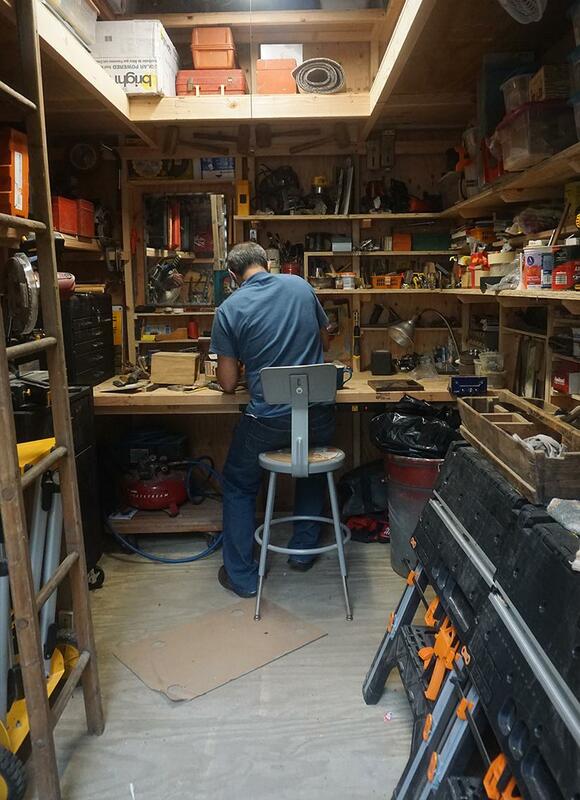 His workshop is so neat you just want to go in there to get away from it all and work on some nice little project. Jerry used these plans to build his neat shed. Here's a barn shed with porch built by David. He actually purchased 3 of my shed plans and incorporated bits and pieces from each one to build this neat shed. 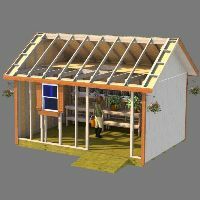 Read more about Davids barn shed and his outstanding testimonial about the plans he bought from shedking. 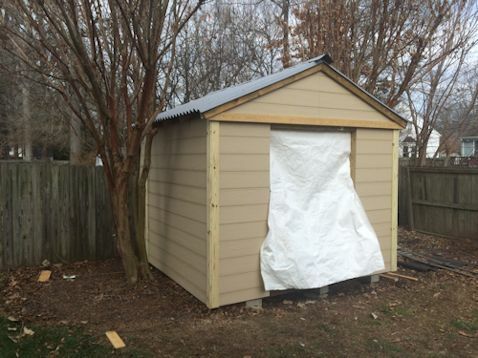 Jeff built this 12x20 saltbox style shed that he is using for a really cool looking workshop. 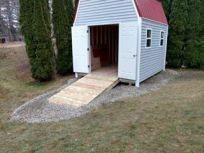 He modified my 12x16 saltbox shed plans by adding on another 4', and the plans show double shed doors but Jeff added a really functional and useful roll-up shed door. 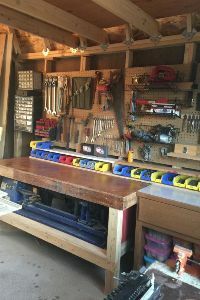 Inside Jeff's shed is his really neat workshop that looks well organized and quite functional as well. Getting tools and projects in and out of his shed is going to really be easy with the roll-up shed door. The additional windows he added let in lots of natural light too! 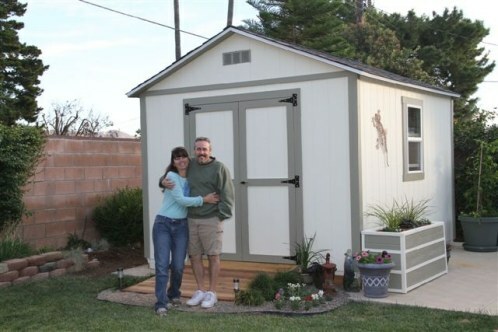 You did a great job building your shed Jeff! Thank you so much for sending in your shed pictures. 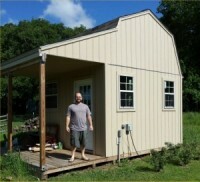 You can read more about the plans Jeff used here: 12x16 saltbox shed plans. 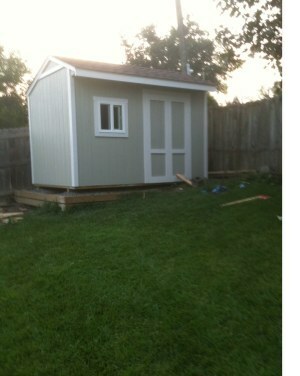 This is Dan's 12x10 saltbox style shed. 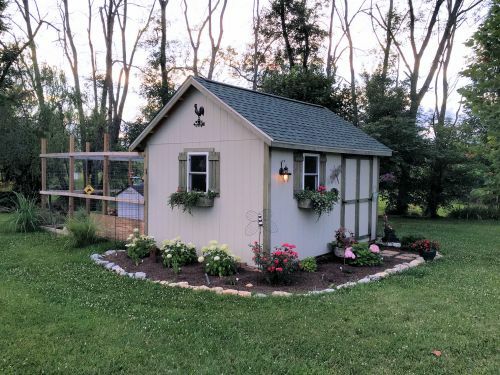 This shed has lots of character, makes for a nice garden shed, and can be spruced up with a nice flower box under the window. See more of Dan's Awesome saltbox shed. 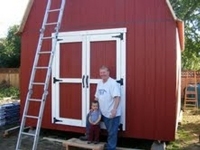 Craig and his son built this awesome 12x16 barn shed that has lots of storage space inside and a huge loft. See more of this neat shed job. 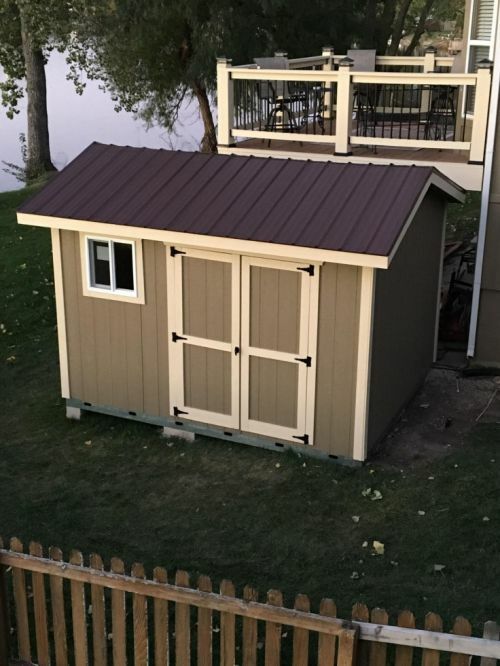 Jason build this awesome 10x12 barn shed with metal roof and vinyl siding. He also added a few windows and pre-hung double doors. See more of Jason's neat shed. Rod built this 12x16 barn shed while coming home from the Middle East. Rod is standing in front of the shed with a little boy they take care of.. (Ross) who was so impressed by the event he's been running around hammering nails into whatever he has the strength for: foam, pumkins ect. Yes, in spite of a few mistakes I deemed 'minor'... at the end of the day I was very proud and felt I had completed a major accomplishment. 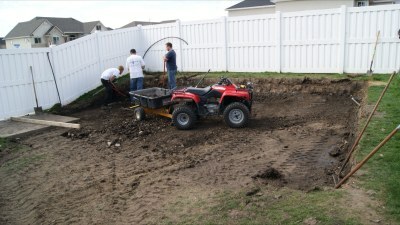 Here's the pictures Rod emailed to me of his project. John Miller sent me pictures of the 12x16 barn with porch plans and the job he did was absolutely fantastic. He added a metal roof, pre-hung side door, and windows on either side of the entry door. This project is going to be used for his workshop and various storage needs that he has. The loft area in this barn is great for any storage needs you might have. 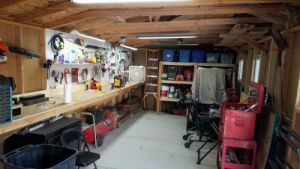 Read John's comments and see more pictures of his barn shed. Plans for this barn can be found here. 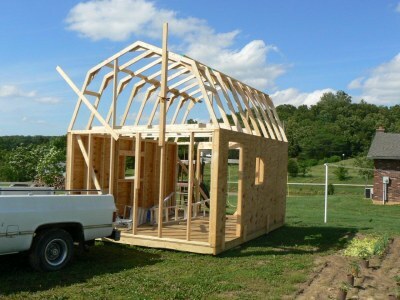 This is a smaller version of our 12' long x 8' wide saltbox shed plans built by Shawn. He did a great job in modifying the plans to build a smaller version to suit his needs. 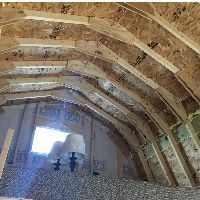 Shawn is from Canada and because of the heavy snow loads he has spaced the roof trusses every 16" instead of the 24" called for in the plans. Good planning and Nice looking shed Shawn! Who knows, maybe I put to much thought into it, however your plans did help me very much, and your willingness to answer questions was much appreciated. I bow to the Shed King...All I have to say is THANK YOU!!! I purchased your plans online to build an 8x12 salt box shed about 3 weeks ago. My wife and I just had our first child and we only have a one car garage and we accumulated a ton of baby stuff so my stuff had to find a place to go, so i needed a shed. I convinced my wife that it would be cheaper building one than buying one at Home depot or Lowes. I was half telling the truth. Lowes has an 8x12 salt box, but it is build with 2x4" floor and 2x3 wall studs and I wanted something a bit more robust. Not to mention that your plans made it so easy for the weekend warrior that I am. 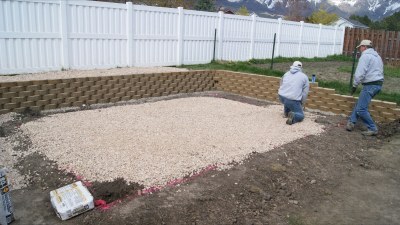 I can do the basic and have done all the work on my home but never took on a ground up construction project such as this one. With a little thought and making sure that you read through your instructions a few times, this project was the coolest and most fun I've had with construction yet. Getting a ton of complements as well from the neighborhood. Best $6.00 I ever spent. 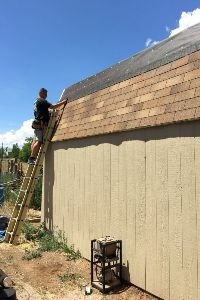 Hi there, I purchased your plans about a month ago, its been kind of slow going with our rainy April that we had but we finally got the roof trusses up today. I forgot to take pics before now (sorry!). 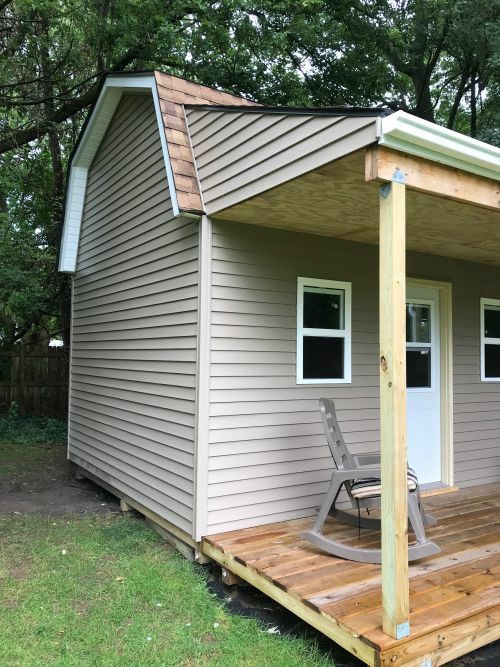 Its 12x16, I'm putting 2 windows on the 2 long walls a 6' door in the front and an extra side door so I can get to the back without kicking the lawnmower all the time. 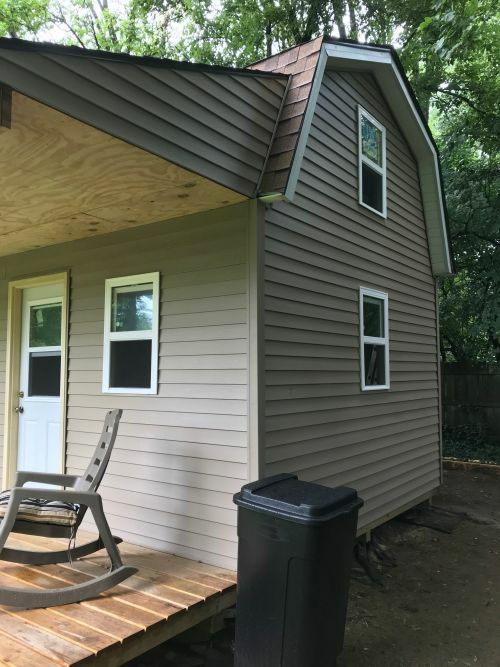 I have a question, I'm not using the same type of siding you used because my wife got vinyl siding almost free from where she works. That will work out fine except now I'm not sure on how to build a door that will look decent and not warp up on me too badly. Any ideas? I was thinking I would get some exterior ply to put behind some cedar framing and paint it, I just wanted to check and see if anyone else has ever done anything different with the doors. Thanks for your time and for the plans, they are excellent by the way. I drew up my framing walls in AutoCad and will share those with you if you're interested (I'm a drafter professionally). 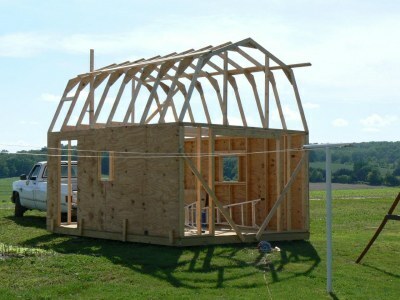 Have a look at the 12x16 Gambrel shed plans. Here's another 12x8 saltbox shed. 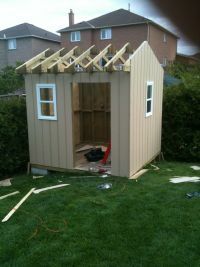 Heres another 12x8 saltbox shed design, built by Jeff. Looks great Jeff. You did a nice job with this one. 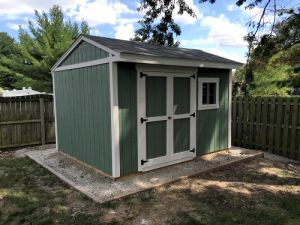 This is not the easiest storage shed to build but if you are up to the challenge like Jeff was, you will turn out a nice shed like this one that can be used for a garden shed, storage shed, chicken coop, or a small office. 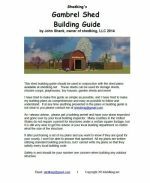 12x8 saltbox shed plans from shedking. I bought your plans for a 12x16 gambrel shed, made a few modifications to fit our application and just finished it. Thought you might like to see the process. Thanks for the plans. They were a great help. If you are wondering about the lime green trim, it is in memory of my father who passed away a few years ago. Thanks again. From the looks of it Robert had quite a bit of prep work to do in order to get to having flat and level ground to pour his concrete shed floor. Now that the concrete cement floor is done, we can finally start building the gambrel shed. 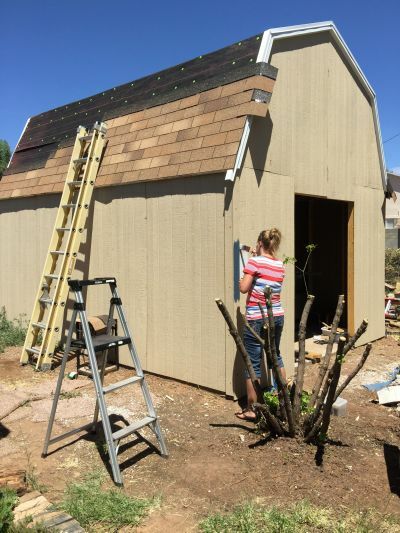 With the roof framing done and loft boards in place, the roof can be covered with roof felt and shingled. What a great job you did building this nice sized 12x16 gambrel shed with loft. 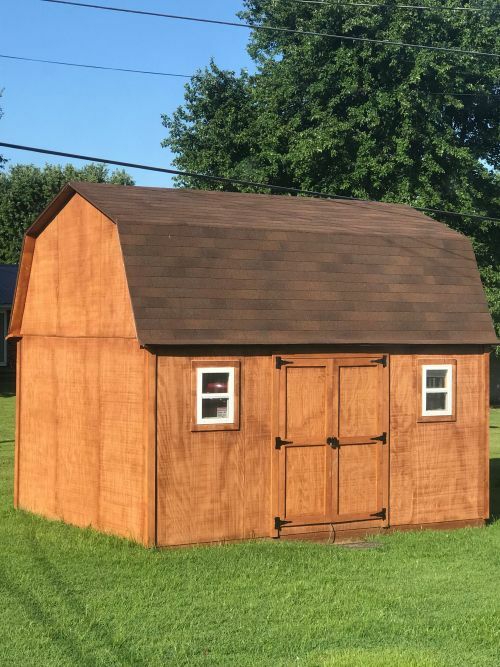 If you would like to look at the plans Robert used to build this gambrel shed with, please click here for the 12x16 gambrel shed plans. 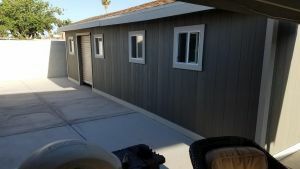 Not only did the Friedman's build a really neat gable style storage shed, their landscaping is beautiful! Nice Job Done! 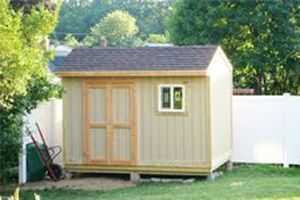 Plans for this 10x12 Gable Storage Shed. 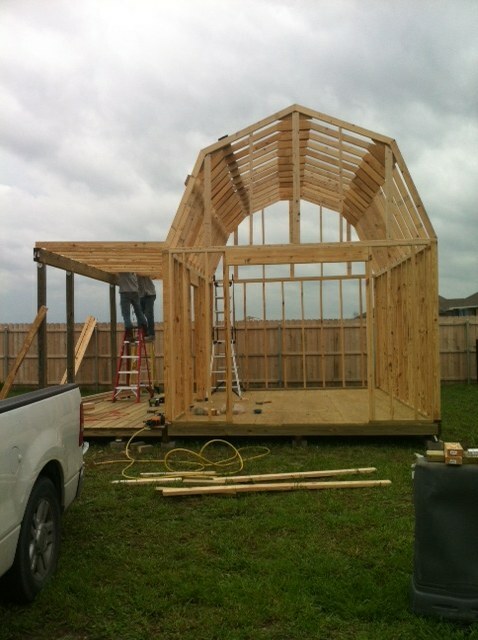 Mary sent me this pic in March of 2012 of the 12x16 barn with porch she is in the process of building. Coming along very nice Mary! 12x16 Barn with Porch Plans. I'm finally building my wife a garden shed. 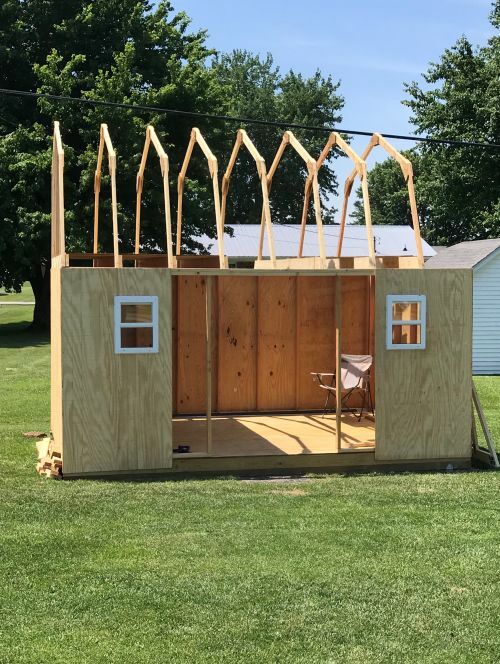 If it ever gets done, she'll have a nice 12'x16' gable style shed to store all her garden tools in and whatever else she needs to put in there. 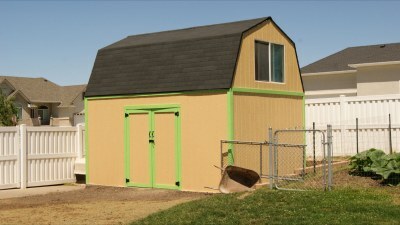 We're also adding on a chicken coop on the back side of this shed so that we can get them back up closer to our house. Less walking to do to take care of the littel buggers!. 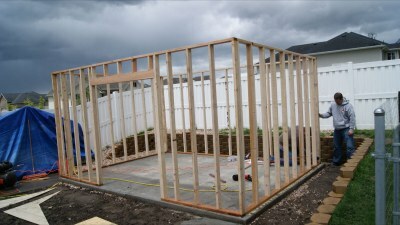 Read more and follow my building progress of Sarah's Garden Shed. 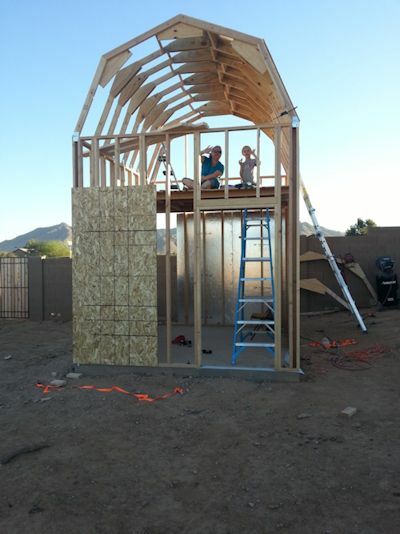 Rod sent me these pictures of the gable shed he is building. 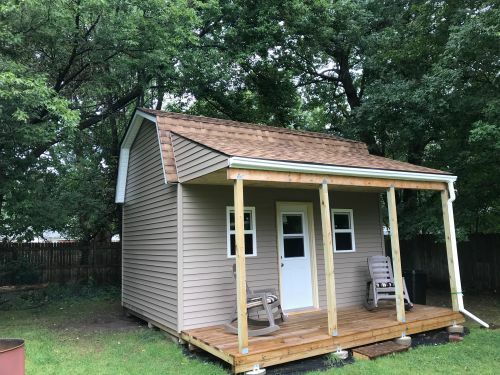 Rod didn't actually build this shed using my shed plans, he built it using the free shed building information right here on this website. 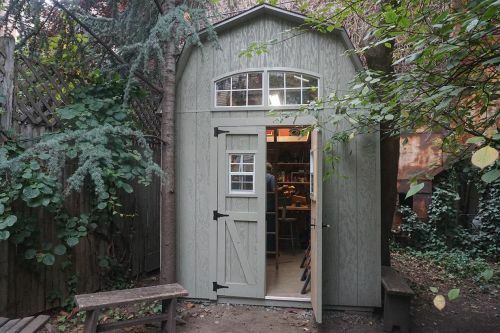 See more of the Rod's pictures he sent of his neat shed. 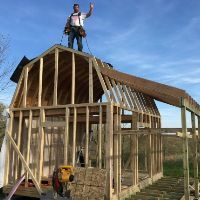 Glenn is building this 10x12 gambrel shed to be used as a playhouse for his kids, then later when they have grown up, Glenn will be using the shed for other purposes. See more of Glenn's playhouse shed. 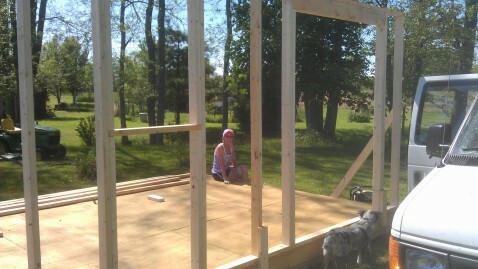 Check out the progress of Cammy's tiny house being built from my 10x12 barn shed plans. This is going to be a neat project indeed! See Pictures of Cammy's Tiny Barn House.